We’d love your help. Let us know what’s wrong with this preview of John Cassian by John Cassian. 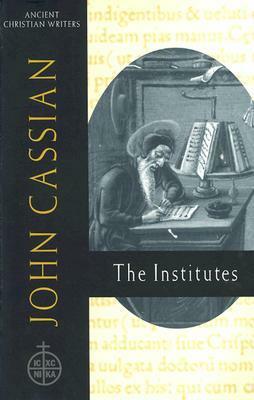 The first written work of John Cassian in which he shares the wisdom of Egyptian monasticism, especially rules of monastic life and lessons on battling the eight principal vices. To ask other readers questions about John Cassian, please sign up. Cassian gives an overview of Egyptian monastic life for those preparing to begin a monastic society in Palestine. Included is an ancient development of the 8 vices, which eventually came to us in the form of the 7 Deadly Sins. You'll find a lot of repetition, but at least you'll be clear on the purpose of monastic life along with its vices and virtues. A sage! A psychologist! Two notes: Jung, and the appendix of The Demons. Lovely and wise, but a disappointing descent from the peaks of Mt. Evagrius. I read this at the Abbey of Gethsemani in Kentucky — Merton’s old place. I kept to my cell and read lengthy sections of it with intrigue in early monasticism. I’m currently a vicar in the Lutheran Church who is intrigued by monastic practice. I feel there’s a lot to glean from the ancient way that could help modern families slow down and attend to the present day, as well as give up the illusion that we’re all supposed to be cogs in an economic machine. No. There’s more. You’ll learn about this More only through silence, solitude, and Scripture, that incarnationally becomes simplicity and compassion (expressed love) through you. Great book. Sets down symptoms of the passions (helps us to identify them), the problems they cause, the causes of the passion, and how to possibly remedy them. Very clear, extremely well organized.